Never Enough Nails: OPI Mariah Carey Holiday Liquid Sands! I finally have swatches of the 6 OPI Liquid Sand polishes from the Mariah Carey Holiday collection! These are the 6 shades from the collection I was most excited about and they did not disappoint. 4 out of the 6 Liquid Sands were a bit different from other Liquid Sands we've seen in that they have a metallic base. They are definitely textured and matte, but they have a shine to them that doesn't come from just the glitter, so they look less matte than others. I did not swatch most of these with shiny top coat. I tried the first two metallic ones with top coat and they honestly did not look any different in the pictures, I think because the metallic base is shiny either way. Obviously if you hate texture, a top coat with smooth that out, but in the case of most of these, it doesn't make a huge change to the appearance. 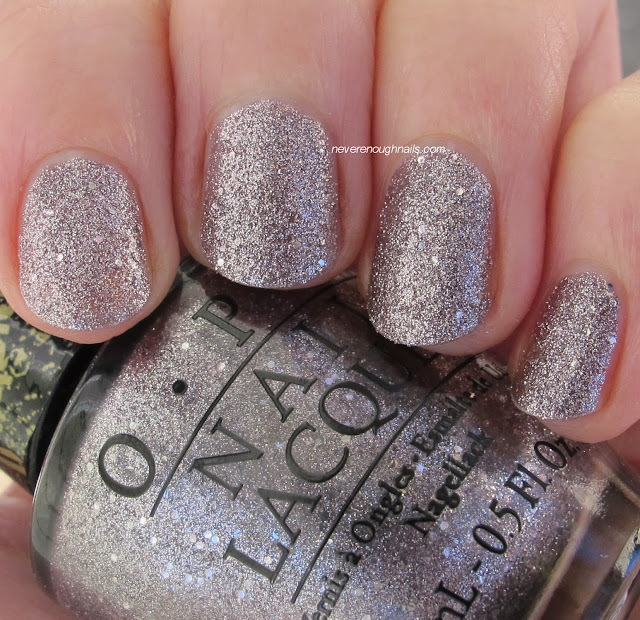 First up we have the lovely sparkling silver OPI It's Frosty Outside. It's Frosty Outside has a blingy silver base with silver glitter. I used three coats of It's Frosty Outside, but I would probably wear just two coats. I wanted to make sure my camera didn't make this look less opaque that it really was. Application was good, no real complaints here. This dried nice and quickly, so I know it'll become a holiday season staple for me. OPI Emotions is a black jelly base with chunky black glitter. Now, if I were in charge of naming polishes, I would have called this "Coal in My Stocking" or something like that. I mean come on, it's a holiday collection and this does kind of resemble coal. But, OPI went with "Emotions". I let this dry down for quite awhile before taking pictures, but I have a feeling it's one of those Liquid Sands that looks totally different after about 2 hours. It's probably much more matte looking later on. This is three coats of Emotions. I did feel like I needed the third coat for full coverage here. It was pretty easy to apply, but occasionally around the edges I could see more jelly than glitter, so you may have to go back and fill those places in if it bothers you. I think you can see this on the right side of my ring finger. 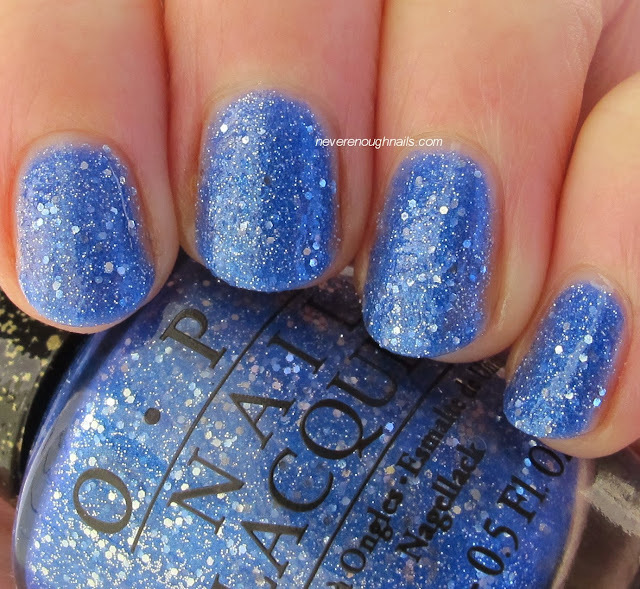 This blue beauty is OPI Kiss Me at Midnight. 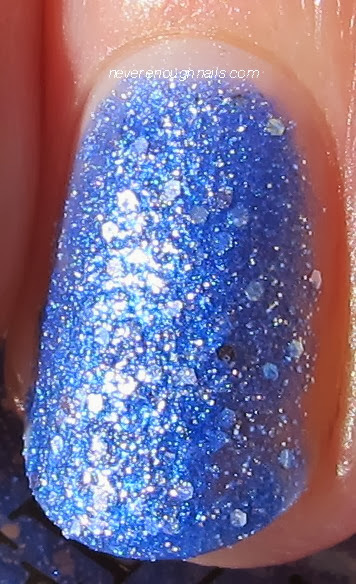 This is such a stunning shade of matte blue with silver glitter, it manages to look both icy and bright at the same time. The color reminds me of some cartoon with Jack Frost. He was this shade of blue, LOL! This is three coats of Kiss Me at Midnight. I thought it looked OK with two coats, but better with the third. This had a good formula, but I found it a little tougher to get a nice rounded edge by the cuticle for some reason. Maybe it was a bit thicker than the others. This is also the only one I am showing with shiny top coat (below). This one actually did look different enough to show you. I love this both matte and shiny. I am really excited about the next three shades, including OPI Silent Stars Go By, because they are going to become my go to neutrals. Liquid Sands are great because they dry quickly and you don't need top coat (honestly, I usually skip base coat too with these unless it is a potential stainer), and having three beautiful sparkling neutral shades is going to be really awesome. 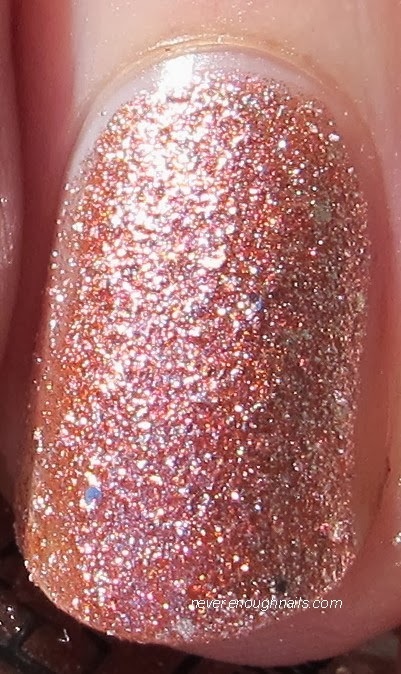 Silent Stars Go By is a gorgeous pale copper/rose gold metallic base with silver glitter. It's very sparkly in the sun, I think my camera freaked out a bit. Too reflective! This is two coats of Silent Stars Go By and it applied like a dream. It'll definitely be in heavy rotation whenever I am too busy for complicated manis. 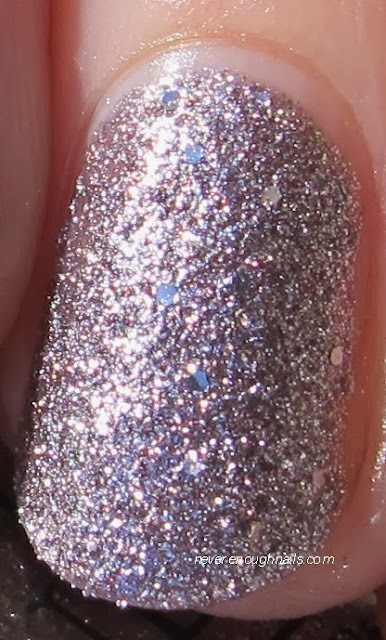 OPI Baby Please Come Home is my favorite of the 6 Liquid Sands. It is an awesome purple-y taupe gray kind of shade that we have definitely not seen anything like so far in the texture craze. It looks different in different lighting, sometimes more purple, sometimes more taupe, but always an interesting shade. It's very metallic and sparkly in all lighting, so it's never boring. This is two coats of Baby Please Come Home and it was very easy to apply. This one is definitely a must have from this collection. Finally we have the pinky copper OPI Make Him Mine. Another gorgeous metallic shade that really catches the light. This is much more of a true copper than Silent Stars Go By. It reminds me of Christmas ornaments and tinsel. This is two coats of Make Him Mine and the coverage was perfect. Nice easy formula as well. Overall, I love these Liquid Sands just as much as I thought I would when I first saw the preview pictures. My top picks are Kiss Me at Midnight, Baby Please Come Home, and Make Him Mine, but I wouldn't want to skip the other three either. I wasn't crazy about Emotions in pictures, but I actually liked it a lot in person. What do you think, any of these catch your eye? 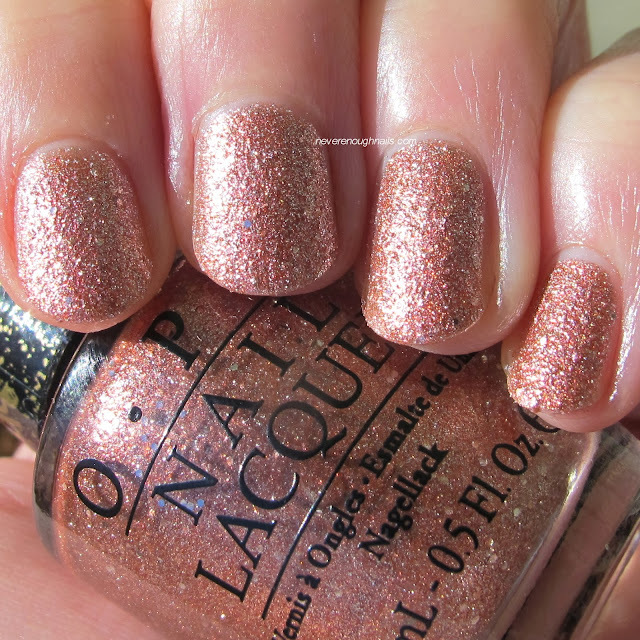 If you missed my other OPI Holiday swatches, check them out here and here. Mariah Carey Holiday is available now at Professional Salons, including Beauty Brands, Beauty First, Chatters, Dillard’s, jcp Salons, Pure Beauty, Regis, Trade Secret, ULTA and ulta.com for $9.00 ($10.95 CAN) suggested retail for each nail lacquer. Thanks Kimberly! Do you have any of these on your list? I've bought Make him mine on Hqhair and I'm waiting it to arrive ^^ but I also love Baby please come home!